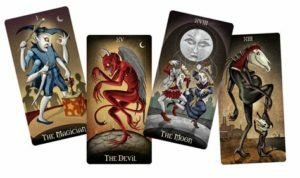 Tarot can take you into deep places within your personal and/or our collective psyche. The Oracle Soup podcast sistas put their expertise into the kitchen blender as they stir up the many facets of “Shadow Work” in Tarot cards. Featured Tarot card: XVIII The Moon – exploring and embracing the light and dark sides of our wholeness. Tarot Nysdrellien is a work in progress by Canadian artist, Heimdayel. Thank you for this version of the XVIII La Lune card. © 2008 US Games Systems, Inc.